Buenaventura – Genifer grew up in Quibdó, the capital of Chocó Department in western Colombia. Due to armed conflict and widespread violence, Genifer was forced to leave home and move to Buenaventura, a coastal seaport city in Valle del Cauca and the most impoverished city in Colombia, with 91 per cent of the population living at or below the poverty line. Genifer was determined not to be stuck in poverty and rendered invisible to the rest of the world, like so many IDPs in Colombia. “There were times when the situation around me was so violent that I thought of leaving this country,” she said. Having to take care of her young daughter, however, gave her the strength and resilience to keep on dreaming of a better life in Colombia, and finding ways to make that dream come true. About three years ago, Genifer enrolled in a school that taught the cooking of traditional Colombian food. 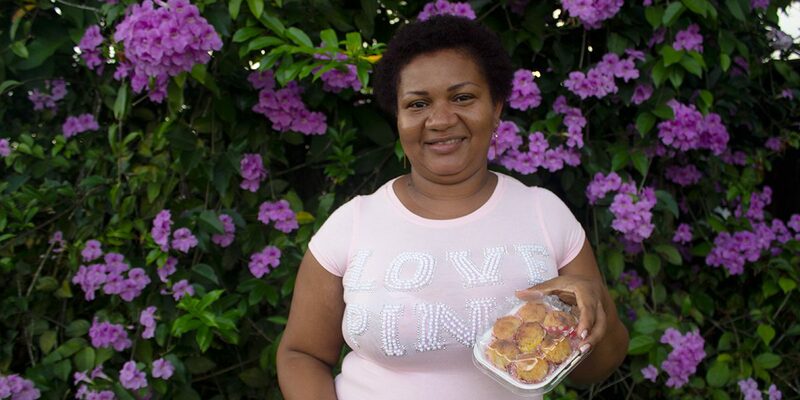 Within a few months, Genifer and three of her classmates had become experts in making cocadas, a coconut-based sweet found throughout Latin America and particularly popular in Colombia. The four women needed income, and decided to pool their money to buy the ingredients to make cocadas to sell on the street. The plan worked: the sweets they made were so good that they sold out at the end of their first day. That was the start of a burgeoning business, and the school allowed them to use its kitchen while they were still enrolled. Once they graduated, however, Genifer and her friends needed an alternative. They tried a wood-burning stove, but the smoke affected the cocadas’ flavour, and sales plummeted. A client cosigned to buy a good stove on credit. “We were so scared of the debt that we only got a one-burner stove,” she remembered. “We were producing cocadas in two flavours, coconut and passion fruit, and doing that on a one-burner stove took too much time”. In 2017, Genifer and her partners discovered JRS Colombia. Through the help of JRS they acquired a stove with multiple burners, and enrolled in a basic accounting course that helped them better manage their business. The four young entrepreneurs are now selling an average of 500 cocadas per day. “Many people order them in advance, so we no longer have to walk on the streets that much to sell them,” said a happy and proud Genifer. The hero of this story is not JRS. The determination, skill, and ingenuity were all Genifer’s and her friends; all we needed to do was to lend them a helping hand.